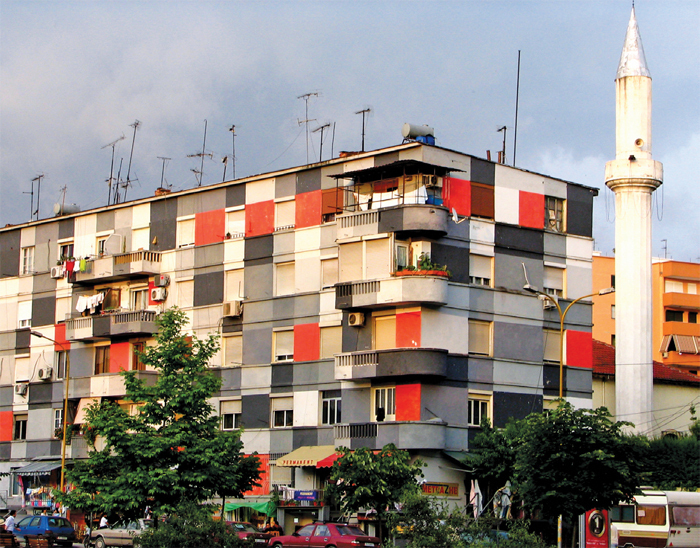 Painted apartment building from the Tirana color facade project, 2001–11, Tirana, Albania, 2007. Photo: David Dufresne/Flickr. Even in our age of endless multitasking, few artists have become world leaders and few world leaders artists (George W. Bush’s watercolors notwithstanding). But Prime Minister Edi Rama of Albania is that extraordinary hybrid: A noted painter and professor at the state art academy in the 1990s, he became mayor of Tirana in 2000 and assumed his current office just this past year. 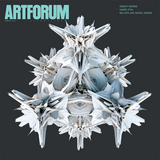 Artforum invited curator Hans Ulrich Obrist to talk with Rama, along with his frequent artistic and political collaborator, Anri Sala, and unravel the complexities surrounding his ambitious aesthetic and social reforms. HANS ULRICH OBRIST: Would you call yourself an artist-activist? EDI RAMA: When I was young, yes. Politics has always interested me, but I never wanted to enter politics formally. I was making a life as a travelerselling artworks, buying plane tickets, discovering the world. But at the same time, I was always writing opposition papers against this or that, being a kind of professional troublemaker. Finally, I was a painter who was caught between colors and conflicts: My works were like an abstract pattern, a code for a secret movement. I’m nearly fifty years old. But from the beginning, I think it was the fact that I started making art on the edge of the Communist regimewhen the Academy of Arts was still totally controlled and socialist realism was the only acceptable method, but when there were also ways to escape if you used your imaginationthat made me an artist-activist. In a way, all nonacademic art or even discourse at the time, in this situation, could be seen as activista way to get to the other side of the wall, whether formal or literal. OBRIST: And then you became extremely involved with the student movement; after the Communist government fell, you began teaching at the academy. It’s a heady time, and you discuss some of the intersections between the utopias of politics and art, and their ensuing corruption, in your book Refleksione . RAMA: Yes. I wrote it with a friend of mine, Ardian Klosi, one of the leading figures of the anti-Communist protests, who tragically committed suicide last year. We had been thinking of reprinting it, adding a chapter about the years since, because it turned out to be quite prophetic. Klosi and I were very upset, from the very first moments of change, with the way the democratic movement was being manipulated. It was the first opposition party recognized by the regime, and it was turned into a kind of faux-populist movement. The city squares were full of people, and full of a strange energyyou could feel controversy and hate in the air, but no positive outlook, no view for a future. Crowds were being misused; they became a kind of decoration. Our “reflections” were very much posed as a diagnosis and an alternativelooking inside as opposed to the movement of screaming outside. Around that time, Ardian and I staged an event in the old theater hall at the academy: no tribune, no stage, no panel, nothing but a dark space. People could not see each other, so it was all about voices. The microphone went around and people could hear voices that were not recognizable, voices spilling truths that people were otherwise afraid to speak in public. This was the first time the situation was articulated clearly, and it brought about a very rapid, radical positioning against the regime. OBRIST: But then you went to Paris, where you lived with Anri [Sala]. How did you reenter Albanian politics? RAMA: In 1998, my father died from a heart attack, and I planned to come back to Albania for three days for the funeral, but instead I never left. My father and I were very close. But we also continually fought: He was a Communist and I was an anti-Communist. He was a very famous official artist, and I was firmly opposed to official art. But he was also a man of tolerance, and I will be always grateful to him for allowing me to grow up without any limits in my way of thinking. When he died, it was terrible. After the funeral, at the reception at our house, I went to make coffee in the kitchen. The phone rang, and it was the prime minister, Fatos Nano, who was presiding over the reorganized government after the political upheavals and economic collapse of 1997. He asked me point-blank: “Mister Minister of Culture, do you want to stay or do you want to leave?” He was proposing that I take a position in his cabinet. And without hesitating, I said, “I’ll stay.” He said, “Really? You want some more time to think?” I replied, “If I think, I’ll leave.” He hung up. Later, his office asked for my CV, and I just wrote: “Edi Rama, born on the fourth of July. That is enough.” And then a day later, I became minister of culture, and my life changed forever. OBRIST: There is a great tradition of artists and intellectuals as statesmen. And of course in Eastern Europe, there was the playwright and poet Václav Havel, who became the first president of the Czech Republic. Were these the kinds of role models you looked to? RAMA: You know, this cultural-political overlap was typical for the former Communist countries, because the political class simply evaporated along with the regimes, so writers, philosophers, artists, social activists, and the like filled the space that was left. But at the same time, the intelligentsia’s political rise didn’t bring a lot of actual change in terms of policies. Take Havel, who remained marginal until the end. He was much more representative of the people, but he had little influence in the government. OBRIST: And yet you view your own term as minister of culture, I think, as actually shifting policy. What were the main things you changed? RAMA: When I began as minister of culture in 1998, I was totally independent. I was not even a member of a party. And the first and most important thing that I learned about politics and image had to do with the way I was dressing, which was the way I dressed before I became minister: in a completely nonconformist way. With my red jackets, flamboyant shirts, or yellow pants, I was like an unidentified flying object in the middle of a sea of dark suits and ties! And I think this made many young people feel like I was representing them, just by my style. I was very young, too, at the time: I was thirty-four. I began organizing a lot of events for youth, as well as international competitions for art, opera singers, young filmmakers, book and art prizes, and then a biennial. I reopened movie theaters, which were nonexistent here; avant-garde cinema had been banned. And I spoke out very harshly against tradition, against the establishment. So I became popular. That’s why I won by a landslide in the election for mayor of Tirana two years later. It was the largest rate of youth participation in an election here. OBRIST: The 1990s was, in fact, a time of a serious return to thinking about the youth vote in Western politics. RAMA: YesI really liked and really followed Bill Clinton and Tony Blair. I think they changed politics forever. They also made it an affair of young people. They were the avant-garde of all that came after in terms of young generations getting involved, communication, imageI know that to say this now, it seems a bit retrogradebut it might also be proof that I’m getting older! I was very affected by Blair and impressed by the idea of the Third Way, because it was the first anti-ideological approach, an alternative to neoliberalism, but also to socialism. You don’t privatize because you are liberal, but because it’s needed, and you don’t socialize because you’re a socialist, but because it’s needed. And in both cases, you do it because it works. If it doesn’t work, you don’t do it. For me, as an Albanian, these two great men were instrumental in forever changing the history of the Balkans by liberating Kosovo and opening a path of peace and democracy for the region as a whole. OBRIST: We first collaborated after you became mayor of Tirana, in 2000, and you started your painting project in the citythat’s how we met, discussing this at “Utopia Station” at the Venice Biennale in 2003. I’ve always wanted to ask you: How did your epiphany about painting and color happen? RAMA: When I took office, there were very high expectations. Tirana was stagnant. And political campaigns in Albania were likewise completely frozen in time: people sitting in auditoriums just as they had under the Communist regime, a table on the stage, no real images, thoughts, or communication. So I brought the campaign to the streets. There was also always an authentic aesthetic dimension, thanks to my background and to the collaboration with Anri. OBRIST: Did Anri make the first campaign video clips? RAMA: Yes. It was the precursor of what would become the urban painting project: We took an old picture of the center of Tirana. We put the photograph in water, then dripped colored paint into the water, and filmed the whole thing. OBRIST: It was a teaser. RAMA: Because it was just this sequence, no message. ANRI SALA: It emerged like a colorful virus on TV. SALA: But you didn’t know what. RAMA: Once I was mayor, we actually started to paint buildings. We simply painted bright, colorful facades on rows of grim socialist block housingand it was transformative. The colors bound together all the volumes that had been wantonly added to the original surface, piecemeal, by residents who needed to expand their living space but who were not concerned with the forms produced by such alterations and the consequent disfiguring of facades. I thought it would be a cheap, effective way to change people’s perception of the country and their common space. It worked. And the project generated the first good international press about Albania after the regime change. OBRIST: It triggered an avalanche of things. RAMA: After the initial color project, after the first Tirana Biennale, in 2001, after acclaimed artists came (thanks to you and Anri inviting them to participate in the facade project in 2003), everyone seemed to want to do something connected with the colored facades. I am very, very upset that this project stopped because of lack of funding. OBRIST: But it could start again, no? OBRIST: Maybe on the scale of a country. It could happen in every city now. And not just in urban centers, but in the villagesas Rem Koolhaas says, the future is the countryside. RAMA: We will go forward with the demolition of illegal buildings, with developing an economic plan, but we need visual change too. So there are, for example, beautiful villages on the Ionian coast where we could try to build a synthesis between old houses and new ones. The idea wouldn’t be to simply repaint them, as we did in Tirana, but perhaps to differentiate the new from the old, while still producing a coherence. And color is not necessarily the only answer. Maybe live events and performances would produce new traditions, artistic rituals that leave behind traces and forms that will eventually reconfigure those spaces. I’m actually going to visit the southern coast soon, with a few artist friends previously involved with the facade project in Tirana, so that we can debate whether and how existing ideas would apply on a countrywide scale and discuss new approaches. Many architects are very interested in Albania because it is relatively unregulated, unlike the rest of Europe. Yet at the same time, there is obviously a downside: all these illegal buildings. You seem to face a quandary: to get rid of these illegal structures, yet at the same time not to fall into the trap of squelching innovationbecause many parts of Europe are so overregulated that real architecture can no longer happen. RAMA: Culture is infrastructure. It’s not mere surface. What can we do in terms of culture here? How can we start something through culture? Of course, financing these ideas is always the problembut we have had ideas that worked incredibly well despite the lack of funds. We organized the only biennial in the world that didn’t really cost anything. And Harald Szeemann was so fascinated by what was happening in Tirana that it inspired him to curate an entire show [“Blood and Honey” at the Essl MuseumKunst der Gegenwart, Klosterneuburg, Austria, in 2003]; he even participated as an artist in the second edition of our biennial [in 2003]. OBRIST: I remember it was one of the last shows he did. RAMA: Yeah, and many young people came. So I want to return to these kinds of cultural benchmarks. OBRIST: Biennials put different places on the map. But at the same time, the biennial is obviously not a sustainable presence: Every two years a city gets an injection and then nothing. You need that kind of injection every day, not every few years. RAMA: Yes, and that’s how I want to see Albania and Tirana and the Balkans as a whole: as a kind of repeatable and recombinant event. OBRIST: Performanceritualis paradoxically enduring because it’s infinitely iterable. And I don’t think it’s far-fetched to connect this idea of the iterable event to your use of social mediaa model of continuous interaction. RAMA: I was pretty much the first person to use Twitter for public debate, or really at all, here. And this sort of debate in real time is fantastic. As prime minister, I decided to hold regular sessions on Twitter. I go online for two hours answering people’s questions. OBRIST: But how many Albanians actually have Internet access? RAMA: We’ve made a lot of progress. OBRIST: How can these digital platforms translate into physical public space? RAMA: Well, one thing I want to do is to build an interfaith museum. Albania is a unique case because Muslims, Christians, Catholics, Orthodox, all coexist in peace here. We had a period of horrible persecution under Communist rule, churches blown up with dynamite and religious artworks burned in the streets. And yet we also, historically, have had an atmosphere of great tolerance. A museum like this could examine the entire Balkan region, too, perhaps bringing together new generations of Albanians both from here and Kosovo, as well as Serbs, Montenegrins, Macedonians, Greeks, as part of a shared history of beliefs. The younger generations are completely ignorant about Communism and its crimes: They didn’t live it, they don’t get it, they don’t care about it, they are indifferent to how we got to this point as a harmonious society in terms of faith, and to what the dangers of taking all of it for granted might be. SALA: It’s refreshing to think of the region as a community of shared references, rather than as solitary places or appendices on the edge of Europe. RAMA: The museum would activate this cross-cultural history, not only with exhibitions but also with spaces for workshops, debates, conferences. It shouldn’t be a frozen, official space where you go to passively look. We’ve already held a competition for the museum’s design; one component that I especially love is the garden museum, which would display the plants mentioned in the Bible, Koran, and other sacred books. SALA: At the same time, it’s not only about building new museums. There are existing buildings such as the pyramidthe deserted, surreal mausoleum built for [former Albanian leader] Enver Hoxhathat could be reconceived and given a new role, a different use. RAMA: And Hoxha’s former residence, too. I really like the idea of using it as a neighborhood guesthouse. To keep the house as it is, to keep everything, even Hoxha’s furniturebut to change the nature of the life inside. At the moment, it’s a guesthouse for politicians, but it could be a guesthouse for many people, a place for everything and everyone that Hoxha would have hated to have around. He would hate a contemporary artist being there. RAMA: Yeah, I want to open up the garden surrounding the house. Before, the whole areaseveral blocks comprising all the residences of the politburo leaderswas completely forbidden, protected by armed soldiers. And when it was finally opened, in 1991, the streets were overflowing with crowds who had never been able to catch a glimpse of it, let alone what was inside. A bit later, when I first saw the house myself, I was shocked. I had this incredible feeling of awkwardness. You see a man who kept this country under his thumb for years, and then you see such banal taste and his utterly banal way of living.